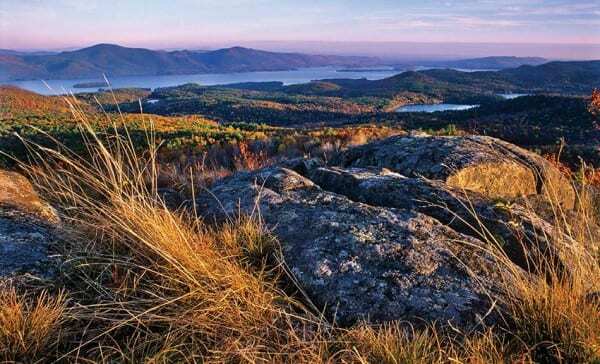 The summit of Cat Mountain offers a magnificent view of Lake George. IF YOU’RE A PHOTOGRAPHER looking for a shooter to emulate, Carl Heilman II is a fine choice. After all, Heilman has been creating iconic Adirondack images for decades, and he knows the hidden (and not-so-hidden) parts of the Adirondack Park as well as anybody. 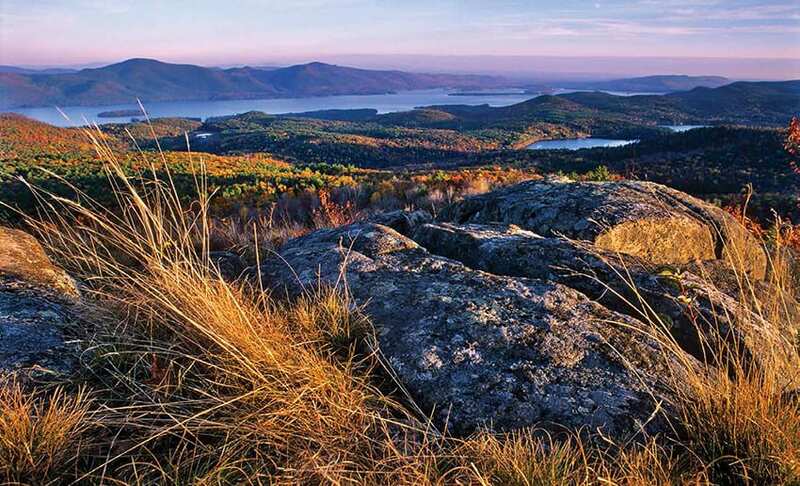 In his new book, Photographing the Adirondacks: Where to Find Perfect Shots and How to Take Them, Heilman gives you a map—literally—that will show you the way to many of the scenes that he’s built a career on. 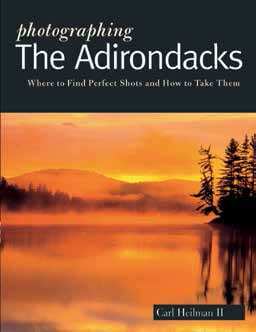 The 112-page book is broken into eight regions, covering sixty-four locations throughout the Adirondacks. Some of those can be viewed from the side of a road; others require more effort, such as a hike to a summit or a paddle. You’ll glean all kinds of nuggets: Scaroon Manor State Campground is a good place for morning views of Schroon Lake. The Copeland Covered Bridge near the Great Sacandaga Lake is the only queen-post truss bridge in New York (you’ll have to Google what, exactly, that means.) The west flow of the Moose River near Thendara gives good lighting options in the morning or evening. Bog River Falls is a “great place to photograph moving and cascading water.” Each of the entries has clear directions for getting there. Although the book is a good reference to show you where to go to make Heilman-like images, it offers less in terms of how to make them. While Heilman spends some time discussing gear and technique in the book’s introduction, he generally stays away from weighty instruction in the brief write-ups of each location. The entries often mention good times of day and seasons to shoot, but don’t get much more elaborate than that. In fact, when you encounter a three-paragraph section devoted to polarizing filters and 10-stop neutral-density filters in the blurb on Piseco Lake, it stands out for its wonkiness. 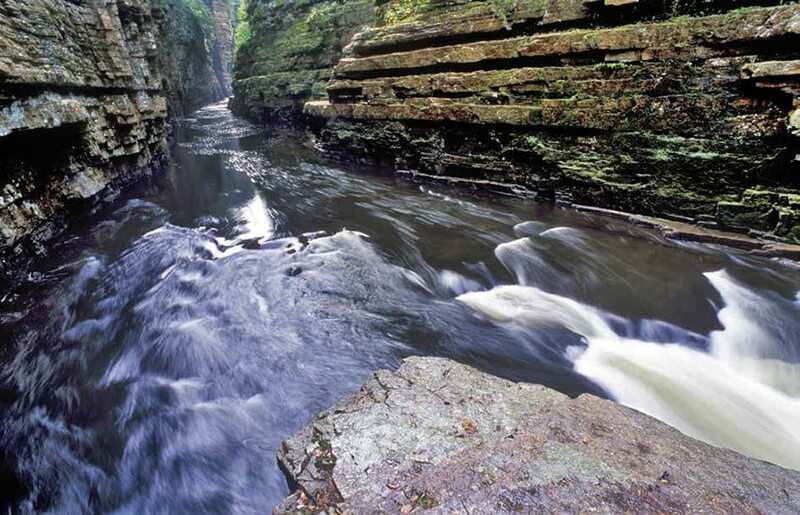 Carl Heilman II recommends photographing Ausable Chasm on a day clouds diffuse the light. On the other hand, this book seems to be devoted to helping people make memories more than gallery-quality photographs. Heilman’s own shot selection seems to acknowledge that: while many of the images on these pages are beautiful and technically adept, there are also many images with a distinct you-can-do-it-too quality to them. He doesn’t even devote any technical information to the individual pictures in the captions—no shutter speeds, no apertures, no focal lengths. Of course, it would be impossible to duplicate the pictures, anyway. Heilman’s work, like any professional landscape photographer’s, is marked by incredible attention to detail. Shots are scouted and planned for. Many of us don’t have time to work with such deliberation. So much of photography depends on the time of day, and the quality of light, and a hundred other variables; I’ve been driving by a scene on my way to work for seven years that I’m convinced would make a show-stopping image, if only the light were just so, and the snow was falling just right, and a touch of haze would fall right there. I’m still waiting. 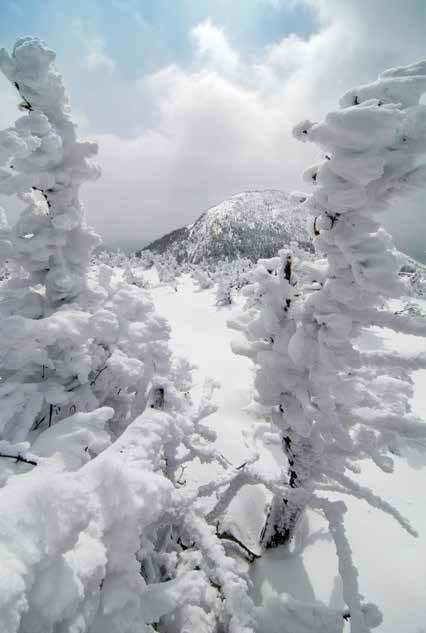 Heilman’s book gives permission to get over that—it encourages a photographer to find a pretty scene and just shoot it. I’m not sure if I’ll use the book to decide what to photograph; to be honest, I’m the type who’s more likely to head in the opposite direction to see if I can find something interesting on my own. Others, who don’t live here and are around for only a week a year and don’t have the time for that kind of exploration, may love having a resource like this before them.